Recently I received a letter from a fellow Unitarian Universalist who is very concerned by incidents and attitudes he perceives among some military chaplains, where they seem to understand themselves as “government-paid missionaries for Christ”. The letter details some of his own research into the issue of some chaplains who view the military as a mission field, and into incidents that seem to show that some chaplains in the U.S. military place a higher value upon spreading the tenets and practices of their own faith tradition over protecting the free exercise of religion within the military. This is somewhat dangerous ground for a fairly new chaplain to tread into, but ours is a prophetic religious tradition. I have a religious imperative as a Unitarian Universalist minister to speak truth as I see it. While it is my experience that the vast majority of the military chaplains I have encountered, (mostly in the Navy and the Army) have a firm understanding and commitment to their role as primarily being one of protecting and facilitating each service member’s practice of their own faith, I have indeed encountered some Chaplains who viewed themselves as “government-paid missionaries for Christ”. More importantly, many of them were acting upon that understanding of themselves and their ministry. In fact, my first few weeks at the U.S. Army Chaplain school, this seemed to be a fairly regular conversation. I would ask one of my colleagues why they had chosen to become a military chaplain, and many responded with a belief that the military was a mission field, and they were looking forward to the number of souls they could save while in military service. Now, this was before it became common knowledge that I was a Unitarian Universalist, and what being a Unitarian Universalist meant. It was also before we had been through the class on the religious pluralism of the U.S. Military… and that the military chaplain’s primary responsibility under title 10 of the U.S. Code is the protection of the free exercise of religion for all service members regardless of religious tradition… not the promotion of the Chaplain’s particular tradition. How many of my colleagues at the Chaplain school really adopted the attitude that their role was to protect, privilege, and facilitate the religious faiths of the service members they serve rather than to try and convert said service members to their own, and how many just learned that saying they were “government-paid missionaries for Christ” was impolitic, I cannot say. I believe that many of my colleagues did have their understanding of their role transform while at the Chaplain School. Most military chaplains I have encountered in my service have understood their role as protecting the right of each service member to practice their faith as they are called. However, I also know that several informed me directly that their religious denominations had told them to simply parrot the “party-line” at the Chaplain School, so they could graduate and then get about the evangelical mission they had been sent on within the military. I also believe that there is an evangelical mission for Unitarian Universalists in the military, but it is not to see how many service members we can convert to Unitarian Universalism. Rather, it is to help our colleagues in the military chaplaincy … and to help our fellow service members throughout the military, understand the importance of Religious Pluralism to our nation’s armed forces. It is to help our military chaplains come to understand that they can best live their faith by adhering to the guidelines for the practice of religion and Chaplaincy set forth by Title 10, by official Chaplain Corps policies, and by the First Amendment to the U.S. Constitution. And to understand that, by violating their sacred duty to place the facilitation of the service member’s own beliefs ahead of any desire to proselytize their own, they are placing in jeopardy the future existence of Chaplains within the U.S. Military. As things stand right now, it would not be surprising to me if a lawsuit filed in the near future were to reverse Katkoff v. Marsh, and have the U.S. Army Chaplain Corps declared unconstitutional. Organizations such as the Military Religious Freedom Foundation and others have been trying to make this apparent to military command… from without. However, I believe that institutional change requires that there also be voices from within an institution who are speaking to the need for change. 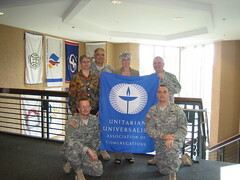 I was once having a conversation with a Military Chaplain colleague about Unitarian Universalism. As we explored together what our beliefs, principles, and values are… how we UU’s learn from many different traditions and sources, our commitment to an ethical morality and social responsibility, and so much more… I remember a moment when his eyes widened, and he said “The military must love you… you all are like the perfect chaplains!” While I don’t know about perfect chaplains and certainly don’t often feel loved by the military, what I think he was pointing toward was that the aspects of serving in a religiously pluralistic military that are challenging for some military chaplains are what make a Unitarian Universalist feel right at home. It has been apparent to me for some time that my career as a congregational minister is made far more difficult by my service as a reserve military chaplain. There are many civilian ministerial positions that I am not a potential candidate for because I have this commitment to the military. I wrestle regularly with whether or not I should just leave the military and focus on congregational ministry, or civilian hospital chaplaincy. The additional salary and benefits that come from my military service do not even come close to making up the compensation difference between the ministries I am capable of serving while also a military chaplain, and those I could competently serve if I were not one. I think of others of my colleagues in the UU ministry who regularly have weekends where they don’t preach, and I envy them. When my military duty takes me away from a congregant during a life-crisis, my heart weighs heavy. The constant concern of whether or not I am going to be deployed, and how that affects any longer-ranged planning for my ministry is trying, both for myself and for the congregations I serve. And gosh… it would be nice if I did not have to pass military physical fitness tests! Two things keep calling me back to service as a military chaplain. The first is the love I feel for these young service members and their military families. I have been both, and the time I get to spend with them is a joy and a powerful ministry. The second is the commitment to promote religious pluralism in the military, and to protect the right of each service member to the practice of their own religious tradition (including the right to have none) from unwanted and unwarranted evangelism and proselytization. And in doing so, perhaps we can keep from a possible legal decision declaring “government-paid missionaries for Christ” the cause for the Chaplain Corps to be declared unconstitutional. Good post, David. This has been a common misunderstanding/misinterpretation among chaplains who volunteer in my community hospital. Few of them have had CPE or any kind of training, so they didn’t see that working to convert hospital patients was an abuse of power and strictly forbidden by hospital rules. Those who couldn’t adapt had to quit. It seems to me that this is doubly true with military chaplains, who are officers. It is a violation of ethics and an abuse of power by a chaplain to try to convert someone. It would seem to me to be illegal to do so and certainly unethical. I would expect there to be something in the ethical guidelines of the profession which would underscore this fact.